Cyber Terrorism is a serious charge. If you have been accused of Cyber Terrorism – you need the help of a New York City Cyber Terrorism Lawyer at Koch Law. As computers become more sophisticated and international networks more intertwined the number of people charged with cyber terrorism and similar computer crimes in New York simultaneously rises. Yet, cyber terrorism charges still involve complex technical information and knowledge that isn’t familiar to many lawyers. Making it essential to hire New York City defense counsel with a background in cyber terrorism and other computer crimes. 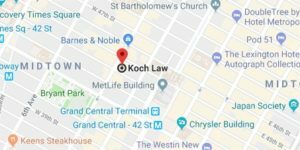 At Koch Law, we handled a wide range of cyber, computer, and fraud defense in New York. The prior experience with these specific, and often complicated, crimes has earned our firm a reputation as one of the top white-collar criminal defense firms in the area. Cyber terrorism is a growing problem in New York and across the United States, which also makes more people susceptible to charges of cyber terrorism. Specifically, cyber terrorism is the use of computers and computer networks to make threats or carry out harmful acts that result in loss of life or finances or lead to bodily harm. The intended result is not just harm to the direct victim of cyberterrorism, but interference with broader infrastructure. However, unlike other computer crimes that can involve fraud or Internet slander, a person committing cyber terrorism usually carries out a computer crime in furtherance of a political cause or initiative. The purpose of the threats or harmful actions is achieving a political agenda or gain. In a small number of instances, cyber terrorism laws are utilized when an individual carries out international computer crimes in furtherance of personal objectives. In the New York Penal Law, the criminal offense of computer trespass is frequently included in an indictment for cyber terrorism. Computer trespass is a felony in New York, and a person is guilty of computer trespass when he or she knowingly and unlawfully accesses a computer, computer network, or computer service for the purpose of committing a separate felony. As a New York City Criminal Lawyer, Koch Law may also take cyberterrorism cases that are charged under federal law. The USA Patriot Act passed in 2001 deals with several different aspects of cyber terrorism, including providing criminal punishment for individuals that use a computer or computer network to cause $5,000 or more in damages, adversely impact someone’s medical examination or treatment, cause another person injury, create a threat to public health and safety, or damage a government computer that is used for national security purposes. Charges for cyber terrorism are extremely serious and a conviction could have a lasting impact on your ability to apply for certain licenses or find employment in some industries. Plus, there is a more immediate and worrisome chance that you will serve time in jail for a cyber terrorism conviction. Our team at Koch Law is committed to a robust defense to cyber terrorism charges. As a top New York City defense counsel in Long Island and Manhattan, we remain committed to winning an acquittal in each cyber terrorism case, including yours.